I recently wrote an Adoption Movie Review of Superman 2. On the advice of several friends, I revisited the movie, but watched “The Donner Cut” instead. This version includes much footage that was omitted from the original cut, and fixes several plot failures. It was a much more enjoyable film, but it retained many of the original cut’s unfortunate messages about adoptee culture. In both cuts of Superman 2, Superman feels the need to deny his Kryptonian identity. In both cuts, Superman’s birth family discourages him from blending his Earth and Kryptonian identities. They seem to deny that he has an Earth-based identity. In this cut, Superman’s father Jor-El explains the reason: It would be selfish of Superman to enjoy his Earth-based identity. Instead of falling in love with an Earth woman, Superman must find happiness in service. As in the original cut, Superman chooses to fall in love, even though to do so, he is required by his birth parents to give up his strength (and identity) as a Kryptonian. In this cut, Superman is shown later, lamenting his choice. He explains that he has “traded my birthright for a life of submission.” He calls out to Jor-El, who responds that Superman “made a mistake… of your own free will despite my attempts.” Jor-El then explains that he saw this mistake coming, and will basically, give his life to allow Superman to reverse the effects of his selfish decision. Superman will never see his father again, but he is restored to being fully Kryptonian. He then erases his choice to be human, and continues living life on Earth, as a full Kryptonian who is only disguised as an Earth man. This aspect of the film mirrors the conflict some adoptees – and children in foster care – may feel. If I embrace the culture and identity of my new family, have I betrayed my original culture and my original family? It’s a real question which adoptees must work to answer. But this movie gets the answer wrong. A message Superman receives from his parents through the first movie and both cuts of this one is this: you’re not like them, and if you want to be like them, you can’t be like us. Superman sometimes seems to want to embrace all aspects of his identity. In this series, it’s the birth parents who discourage him. In real life, it’s often the adopting family that fails to facilitate, or even discourages, integration. And so, Superman never integrates his identities. He is always either Kal-El, Clark Kent, or Superman. But never all of them at the same time. In the original cut, Lois tests to see whether Clark is Superman by leaping into Niagara Falls. 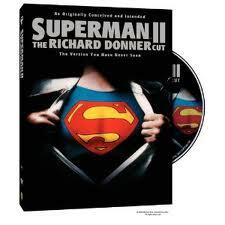 In the Donner cut, she first tests him by leaping out of a building, and then by shooting Clark. We later learn that she only fired a blank, but the scene would disturb children who’ve witnessed or experienced violence, especially gun violence. In my review of Superman: The Movie, I wondered why Superman’s birth mother was not shown to actively participate in the plan for his safety. In the original cut of Superman 2, she is shown as being active in the plan. In the Donner cut, she is absent. o Jor-El told Superman that he could not be both Human and Kryptonian. What do you think? Could he have done both? o Jor-El told Superman that he expected Superman to make a mistake, and that he had a way to fix it. Have you ever felt like you made a mistake? Did you feel like you had to hide it, or did you feel like you could fix it? What helped you feel that way? o With which cultures do you identify? With which cultures does your child identify? Are there any cultures (for either of you) which you haven’t yet explored? How might you go about doing that? Want to know when more movie reviews are posted? LikeAdoption At The Movies on Facebook or Follow Us on Twitter.